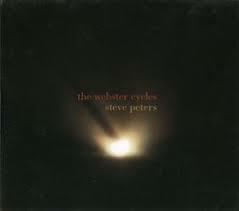 The trombone choir of Steve Peter's The Webster Cycles (Cold Blue 0026) sounds both primal and unearthly. Potentially the work (1980-81) can be played by any combination of wind instruments or voices. It is slowly developing music from the radical tonality camp. The quasi-modal minor diatonic trombone lines unfold slowly, organically, with imitative contrapuntal fundamentals and a sound-within-ambient panorama that reminds a little of early music, a choir of sackbuts, yet it is all as if in a dream and in the end very contemporary. J. A. Deane plays all the trombone parts with nicely turned phrasing and beautiful tone. This recorded version is dedicated to trombone icon Stuart Dempster. This is another good one in the Cold Blue EP series, released some time ago but timeless in its unstinting focus on elemental yet futuristic ambiance. The 30 minutes of the performance, when one listens closely, go by in some extra-temporal sense. It feels like neither a minute nor a day. It is beyond the ordinary lifeworld and instead belongs to the realm of spirit, if you will. Another compelling Cold Blue release. Heartily recommended.